In the time that we live in, nothing can be more enclosed and enveloped than our own heart, our mind, our thoughts, our desires and ourselves. Talking about myself as my Father sarcastically describes me ,”Concealed, shelled and Introverted”. Yeah things are like that from the beginning. And as I’ve mentioned here again and again that expressing things is something that I am really really not good at. Being like this feels good but yeah I am a hell difficult of a person to know and understand. I am hell unpredictable in terms of temper and expressions. I’m now in Final year of my Pharmacy School and according to my fellows they still could never know much about me. They face difficulty in figuring out my expressions and to them it was initially an unexpected thing that I do feel upset about little things which do not affect others. Well, this uncertainty of mind and unpredictability in behavior is even alleviated in times of stress (which I am in from a couple of days), whether it be self created or just God-gifted. I do believe in self-created problems, exaggerations and stuff and I do believe that I make them too. Somebody once said it right … “Life is all just a matter of Perception”. Yeah and there are a few things that change your perception.. the way you take things, the way you look at them, the way you interpret them and the way you think about them whether that be optimistically or pessimistically. One way or the other we all are prisoners of our hearts and minds. Our soul was set free by the Creator but our thoughts are still captured and entrapped within ourselves. I feel this within myself. A huge mingled puzzle within my mind .. entrapped and constantly flipping between whether its “Yes” or “No”, in everything that is due and everything that is not, everything that is mandatory and everything that is not, everything that is to be valued and everything taken for granted, everything to be remembered and everything forsaken and for everything that is imposed upon me by myself. 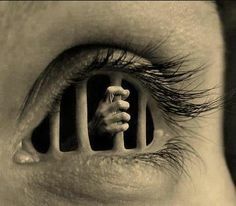 I am my own prisoner and my own owner as I see. I own myself but still I retaliate. I work for myself but yet I work against my own. And never have i read a mind as fickle as mine may be. And never have I heard of tears more ghostly barren than mine. Never have I dealt with anyone more difficult than myself.. Previous If I hold you in my heart ..